↑ "Turkish-American scientist among winners of 2015 Nobel Prize in Chemistry". ↑ "American Academy Announces 2004 Fellows and Foreign Honorary Members". 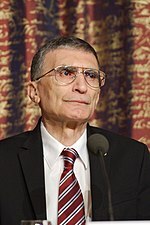 ↑ "Biology : Aziz Sancar elected to the National Academy of Sciences" ওয়েব্যাক মেশিনে আর্কাইভকৃত ৩ মার্চ ২০১৬ তারিখে. utdallas.edu.